Orlando, FL – High-power lasers are now widely used in additive manufacturing and laser welding systems to precisely cut and weld metal, making all kinds of metal parts for medical devices, aerospace applications, automotive industries, and more. With the rise in industrial use of high-power laser processing, manufacturers increasingly seek high-accuracy, point-of-use laser power meters that can quickly report laser powers at any time in the manufacturing process — a vital aspect to controlling product quality. Traditional laser power meters, however, are often bulky in size and slow in response time. Power measurements can also only be taken separately, interrupting the manufacturing process. In the new version of the Smart Mirror, the researchers improved the measurement sensitivity by 100 times and decreased the response time by 50 times. They also mitigated static sagging errors of the device caused by gravity when the device is rotated. 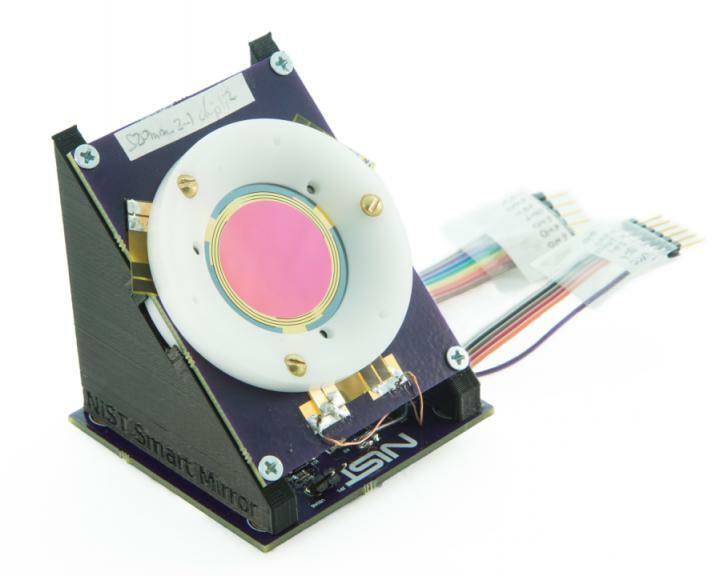 This allows the sensor to be embedded at the end of a robotic arm or in additive manufacturing and laser welding systems where the laser head will move and rotate — a key feature that the early version bulk RPPM lacks. It also meets the measurement requirements of many commercially significant applications. Hear from the research team: ATh2A.2 "Non-Absorbing, Point-of-Use, High-Power Laser Power Meter," by Alexandra B. Artusio-Glimpse, Ivan Ryger, Paul Williams and John Lehman, at 10:30 am on June 28, 2018, at the Wyndham Orlando Resort International Drive, Orlando, Florida, United States.